So remember earlier in the week when I wrote about having grace with yourself in whatever season you're in when it comes to spending time with God? I promised you a post with some practical ways to apply that; ways to squeeze in that time during your days. 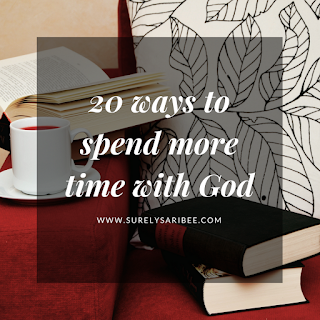 No matter how busy you are, there's got to be some sort of time you can repurpose to get in some prayer or Bible time. You're in the season you are in for a reason. If you find yourself thinking "well, that's now how time with God is supposed to look like," I encourage you to reframe your thinking. It's supposed to look like how it is right now in the God-given season you're in! 1. Listen to the YouVersion Bible app. The Bible audio is a bit more than 70 hours long. If you have a half hour commute every day, you could listen to the Bible three times each year just in your daily commute. 2. Listen to sermon podcasts. I like The Village Church's podcast. 3. Listen to other Christian podcasts. I'm a huge fan of Journeywomen and Mom Struggling Well. 4. Pray! Maybe you pause your music or podcast every time you're at a red light and you make a habit to pray at red lights. 5. Worship through singing. I don't like singing in front of other people but some of my best times worshipping in this way have been in the car. I've got a Spotify playlist of some of my favorite songs here. 1. Have the YouVersion Bible app reading the Bible during a meal time as a family. 2. Challenge the kids to a lightning-fast round of cleaning up their toys while blasting the high-energy tunes of Hillsong Young and Free. 3. Meditate on the truth-filled lyrics of Audrey Assad's music while cleaning the bathroom. 4. Cuddle or rock a fussy baby with this mellow worship playlist. 5. Listen to the Risen Motherhood podcast while you're showering and getting ready for the day. 6. Print out free Bible verse coloring pages to color on your own as your kids camp out at the table with you coloring too. Try to meditate on the verse you're coloring. 7. Write the same verse on at least five index cards and tape them around your house, your car, your office, so it's constantly in your face all day, to help you memorize it. 8. Pray for a different person or prayer intention for every plate or pot you scrub. 9. Make a double batch of dinner and freeze it for the next time someone in your church has a baby or has surgery. Service is a spiritual discipline too, alongside prayer and fasting and scripture study and all that other good stuff! 10. Pray for the members of your family as you're packing their lunches. 1. Pop the headphones in at the dentist's office and listen to a podcast or worship music. My dentist doesn't mind - they actually encourage it to calm your nerves. 2. While in the waiting room waiting for a doctor who is always running late, read a Psalm in the YouVersion app on your phone. 3. Take Instagram and Facebook off your phone's home screen and put the Bible app on there instead so when you mindlessly pull out your phone in the grocery store checkout line, your top option is to read a verse or two. 4. Set your alarm to wake you up with worship music. If you take a while to wake up, that's a nice chunk of time to let the words get into your head for the rest of the day. 5. Pray as you fall asleep for the night. I take a LONG time to fall asleep and some nights it's the only way I can get calm enough and my mind clear enough to sleep and it's so nice to end the day like that. I love this! Any way to make God or priority is great! Thank you for sharing.